If you ever find yourself staring down a manta ray, you’ll probably notice two things right away: the massive, flapping fins that produce the shark cousin’s 20-foot wingspan and the two fleshy growths curling out of its head that give it the nickname “devil ray.” A new San Francisco State University study shows that these two very different features have the same origin — a discovery that reflects an important lesson for understanding the diversity of life. “Small tweaks in early development can contribute to larger differences in how animals’ bodies are laid out,” explained San Francisco State Professor of Biology Karen Crow. For Crow and her graduate student John Swenson, now a Ph.D. student at the University of Massachusetts Amherst, the hornlike "cephalic lobes" of manta rays represented a curious problem. All types of fish have two sets of paired appendages, like fins. But somewhere in their evolutionary past, a group of rays appeared to acquire a third set. These cephalic lobes are used for feeding, allowing some species to grapple with shellfish while helping species like manta rays more efficiently hoover up tiny plankton as they flap their way through the open ocean. What wasn’t clear was just where these fleshy face funnels came from. 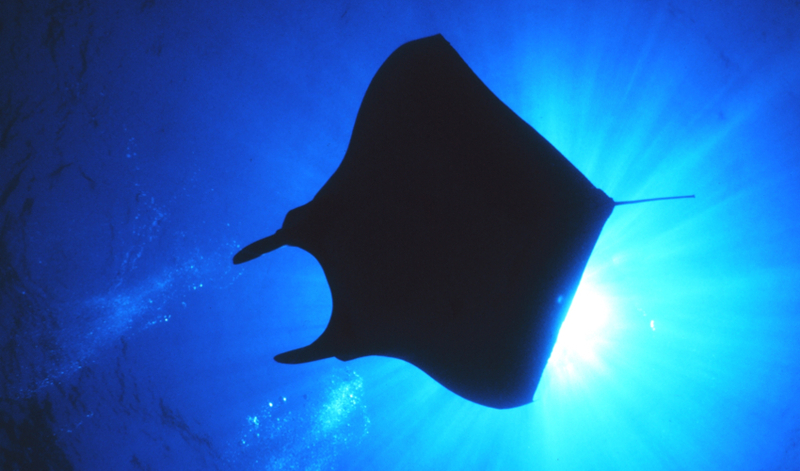 To investigate, the researchers studied the embryos of cownose rays, the closest relatives of the massive mantas. They took samples of genetic material at different stages of the rays’ growth to see which genes were active during fin development, akin to peeking at the growing ray’s assembly instructions. The team examined hundreds of genes and paid special attention to several “Hox” genes, which contain instructions for growth and development of fins and limbs. It’s a group of genes crucial to development in all animals, including humans. The team’s results showed that the ray’s horns aren’t a third set of appendages at all — they’re simply the foremost bit of fin, modified for a new purpose. They found that the same Hox genes that guide development of the rays’ cephalic lobes also play the same role in the fins of a closely related ray species, the little skate, which doesn’t have cephalic lobes. In fact, the way the horns develop is surprisingly simple. All it takes is a tiny notch that deepens and widens as the manta grows, separating each fin into two distinct parts: one for feeding and the remainder for swimming. The team published their results in the journal Frontiers in Ecology and Evolution on Nov. 13. The researchers say that the findings support a consensus that’s emerging among scientists who study evolution: Strange, novel features in nature can often arise from tiny evolutionary tweaks. “Whatever genetic changes occurred, there were far fewer than what we expected,” said Crow. A devil ray isn’t so different from its hornless cousins. And that lesson applies on a broader scale, too, she explains. “We share the same genetic toolkit with all the other animals — and we share many of our genes with all living things,” Crow said. Jeff Klomp, a research associate at the University of North Carolina, Chapel Hill, and Robert Fisher, a marine scientist and fisheries specialist at the College of William and Mary, were co-authors on the study.